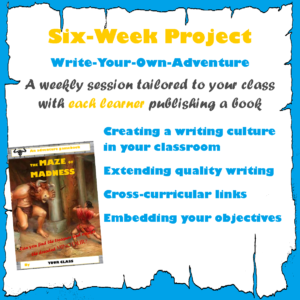 Over six afternoons, typically spread over a halfterm, your class can each produce a Write-Your-Own-Adventure of their own. 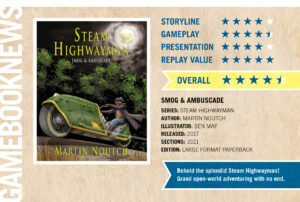 Depending on their age, confidence and literacy abilities, this might be based on their own imaginative adventure or a variation on a theme the whole class explore. One thing is for sure: once they have completed their first, they’ll be desperate to develop their ideas by creating a sequel! When children realise that the options they write at the end of each page have a real effect on their readers – their friends and family – and can lead them through a puzzle or trick them into a gruesome end, they become powerfully motivated to write. Learning to plan and adapt structures of choice also lays important foundations for programming and working with logic. Sessions are tailored to the needs and abilities of your class – typically KS2-KS3 – and take account of any SEN and EAL requirements you have. Thorough debriefing after sessions provide the opportunity to use this as an assessment opportunity in a non-testing manner. Planning can be provided if required and your termly spelling or grammar learning can even be incorporated, to give a real relevance to these crucial areas of literacy. Your school will need to provide some basic materials such as paper and card. Prices for a full project begin at £900 per class. If you’d like to find out more, use the following form to make a provisional booking.